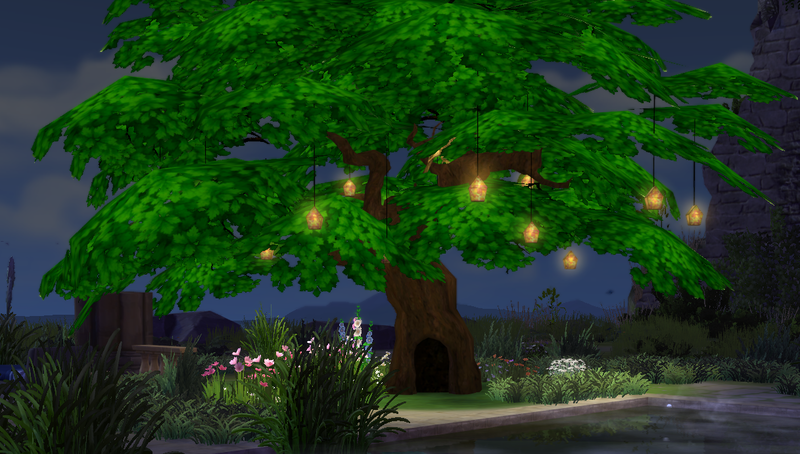 I love this tree and felt it had a lot to offer in the way of beautiful outdoor decoration and lighting. 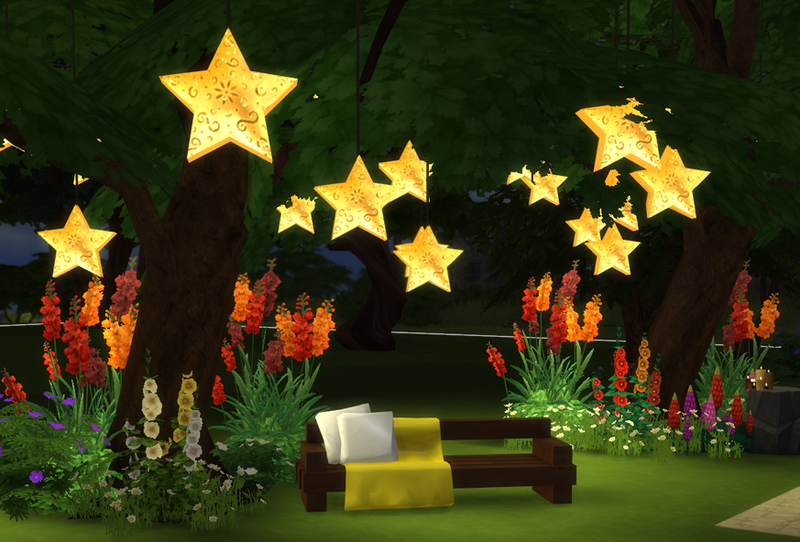 I changed the lanterns to stars (which drastically reduced the poly count), There are six colours, pastels, gold, silver, spirals, water colours and glitter. I also changed the bark to a darker more realistic effect. It came with Movie Hangout and although this is a separate mesh I don't know if the stuff pack is needed for it to show. I am going to make a couple more of these with different lights. Credits for items go to AOM for the candles and ThingsByDean for the Reclaimed Wood sofa, both are available in this forum. 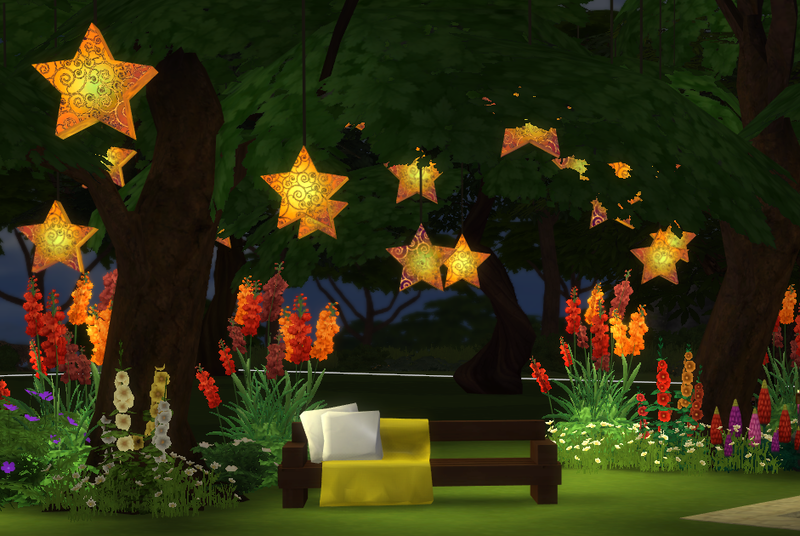 I plan to use these trees to brighten up parties, weddings, parks and outdoor dance parties, and maybe even Christmas. I hope you have fun with them too. 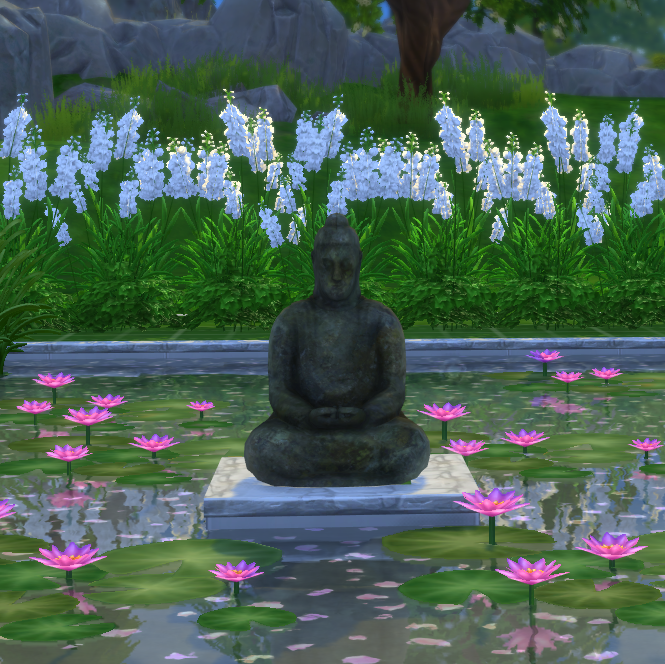 I almost forgot these trees are NONE-FADE, I put them at the back or side of my lots so they don't restrict my view. Will no longer be put in toy boxes. I've been hanging on to these because I spent ages fiddling about trying out different patterns and whatever. But I decided its time to share. 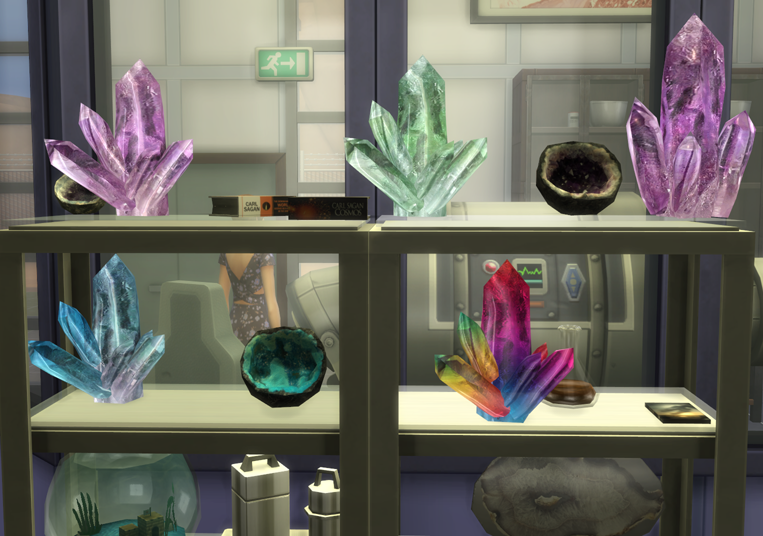 Four crystals, the texture is amethyst but I added another three colours for diversity. Tiny foot print/mesh size (Verts-284 polys 452), Mesh by Me; cloned from the pitcher so any game friendly. Found in clutter £50. This bed and shelf were inspired by a picture of a bedroom with open French doors leading to a beautiful roof top garden. The room was bright and simplicity itself. I named it after a lady who loved her garden. The bed was cloned from the painter bed, meaning its stats are amazing, around 5 hours sleep and they are up and ready to go, which is why its £800. My artists needed something different and they are all rich. The headboard as you can see has lots of slots, there are 3 medium, one on the bedside surface and one central above the bed. 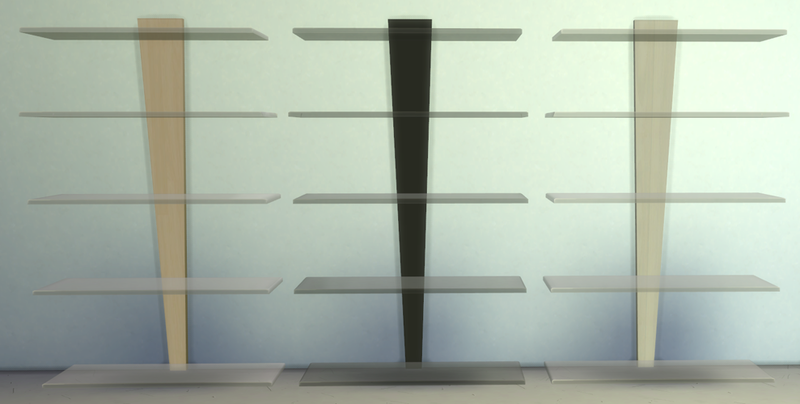 The shelf is included in the zip, it was and still operates as a bookcase but with lots of slots. I hope it comes in useful. Orange Mittens, Sprouts and Avo. Mio-Sims conversions, basket of books, ship, Cassandre pumps. Kreston22,flat shoes, coffee cup, bag. New Pumkinpie Spice,Lavender basket. HelleN, book & glasses. Severinka, summer hat, deck chair. Martine, curtain, mesh Shinokcr. AdonisPluto, sunflowers & lupins. Pilar, lavender in garden. BlackcatPhenoix, window. Me, crystals, vase, DVDs, books, pink/white shoes (Cassadre re colour), candles. 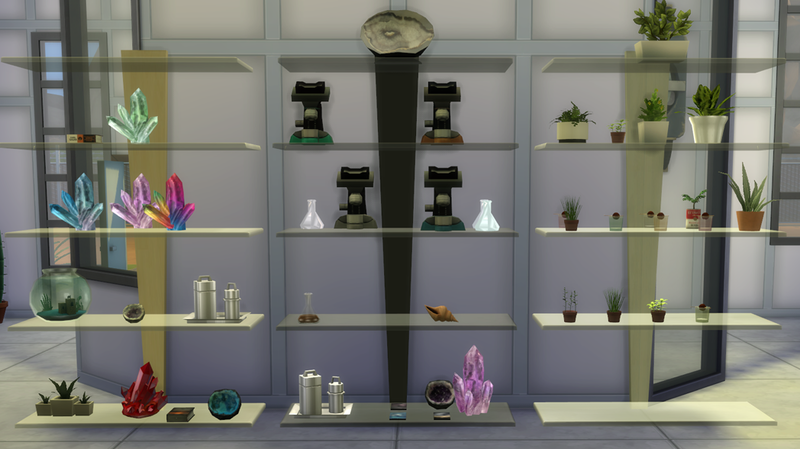 I wanted something very light for my lab and as I designed this for the Sims2 but never made it I thought why not. Base game friendly. Very small mesh polys 115. Three colours, blonde wood, black and white wood. Found in misc, £100. Credits, Sprouts & Avo, Orange Mittens. 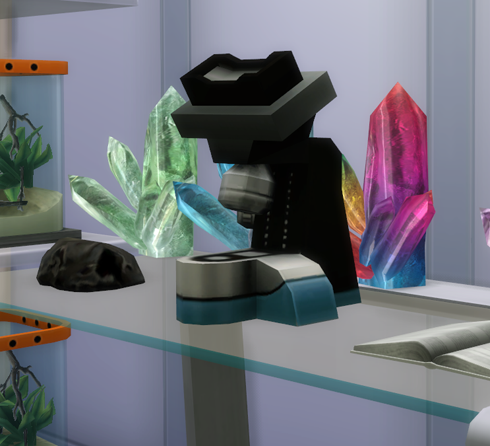 Carl Sagan books, IronLeo78, Plant, conch, Veranka. Herbs, Shinockr. 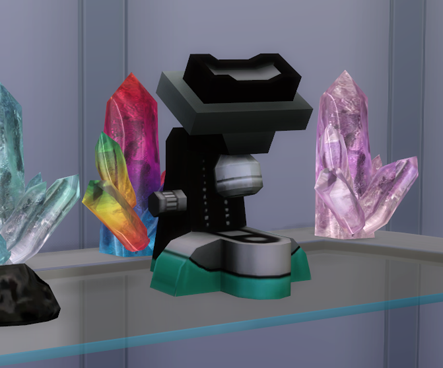 Microscope, beakers, crystals, Me. I downloaded this a while ago with the intention of making a small table top sculptor, but the mesh is very poly heavy (3584). 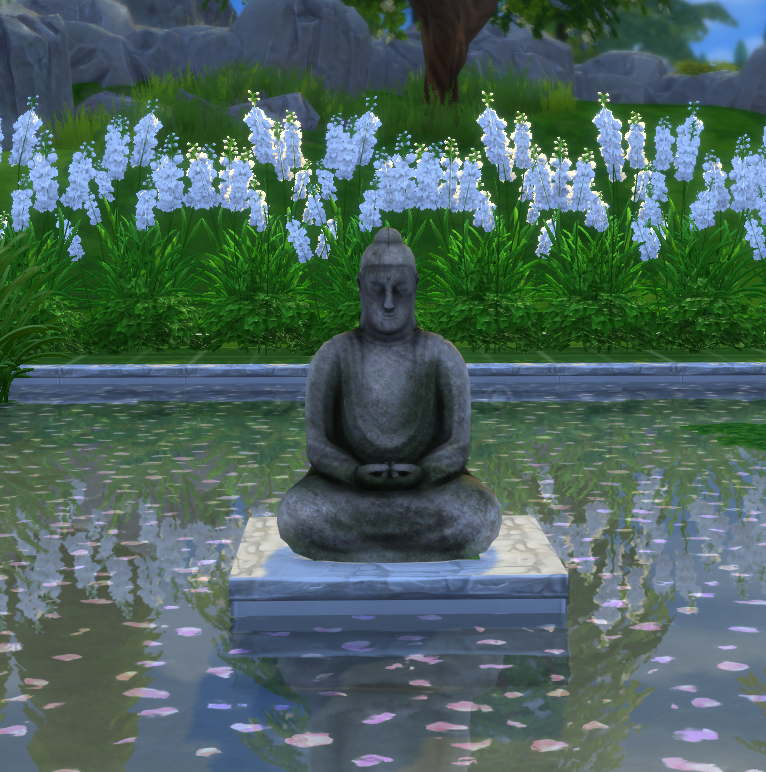 So I've finally got around to making it a garden or meditation centre piece instead. The mesh is by Giovanni [email protected] Blender and so is the first texture. The other two are mine. £300, found in sculptors. I really like this sculptor I hope someone else can find a place for it too. 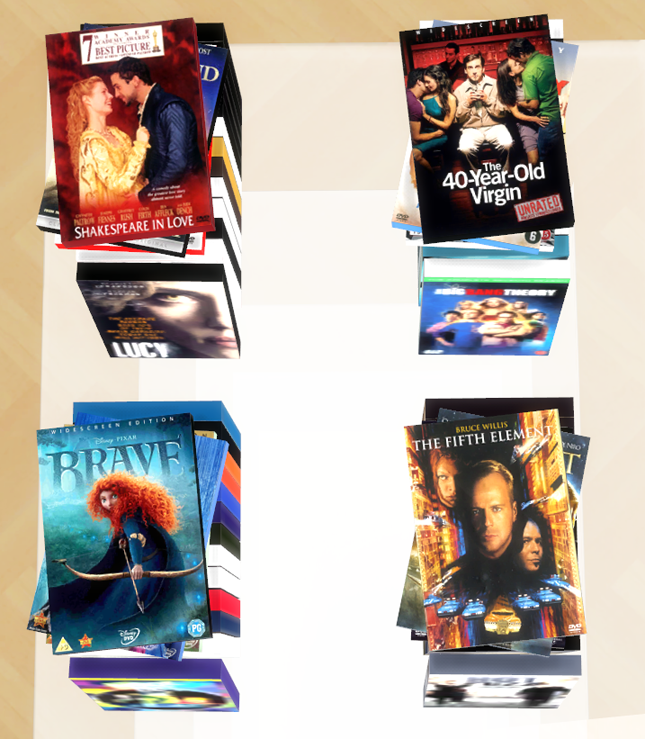 A small collection of DVDs clutter. There are eight altogether, I tried to do a good mix. 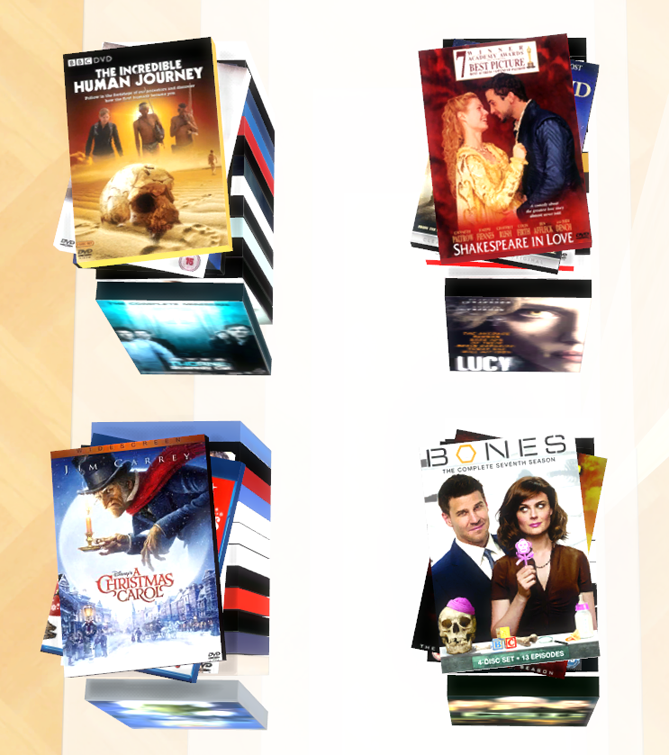 There's a bunch of Bones/CSI, Healthy living/Yoga, Sci Fi , sort of Girly movies (I'm not great at these, tend to add squint stuff). Kids, Xmas, funny stuff, classics. £35 found in clutter. My mesh, feel free to re colour & make your own choices. I liberated this from the kids chemistry table, made it bigger and forced it to take on new colours and personality. Great lab decoration. Four colours just for the hell of it, outrageously inexpensive as far as scopes go £45.I added 3 empty glass flasks/beakers as well because I just couldn't leave them all alone on that table. They are very shiny glass and have three tints, white, blue, green. £10.Both in the same zip and are found in clutter. 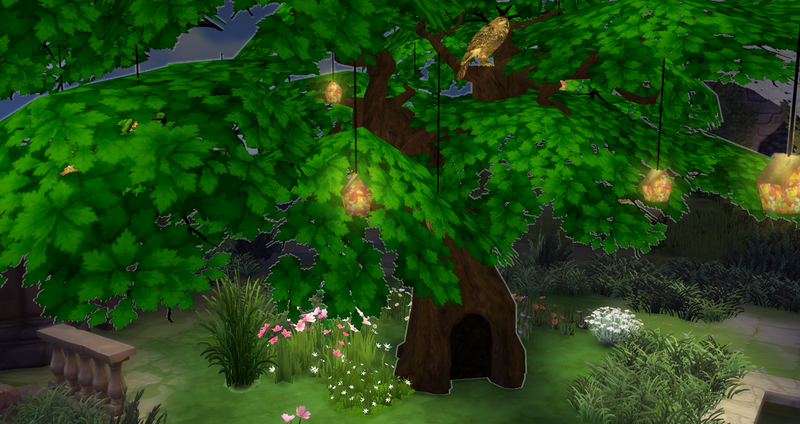 I made this tree a few weeks ago but wanted a bird in the branches. 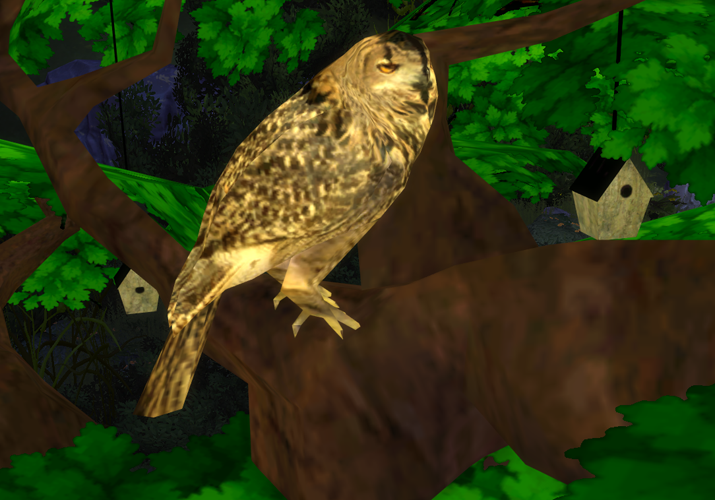 After 3 frustrating weeks of being able to mesh birds but not being able to produce textures that I felt were acceptable I asked Asyli for help re her lovely owl mesh from the Sims 2. She said yes. 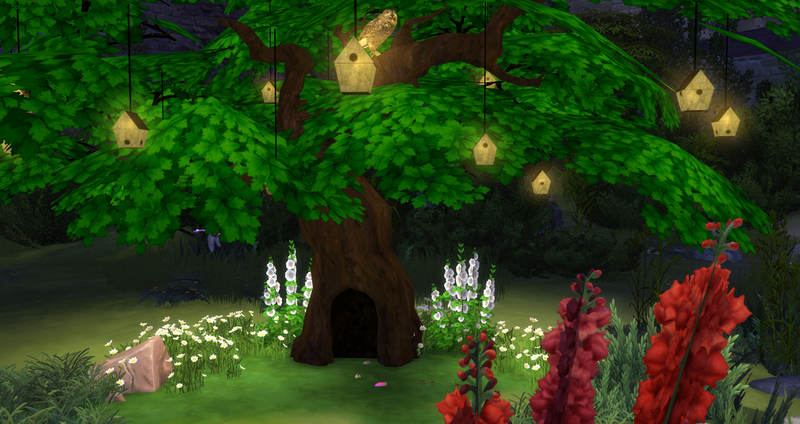 So here is the Tree Of Life, I was thinking about somewhere for wildlife to hide or inhabit when I put it together. 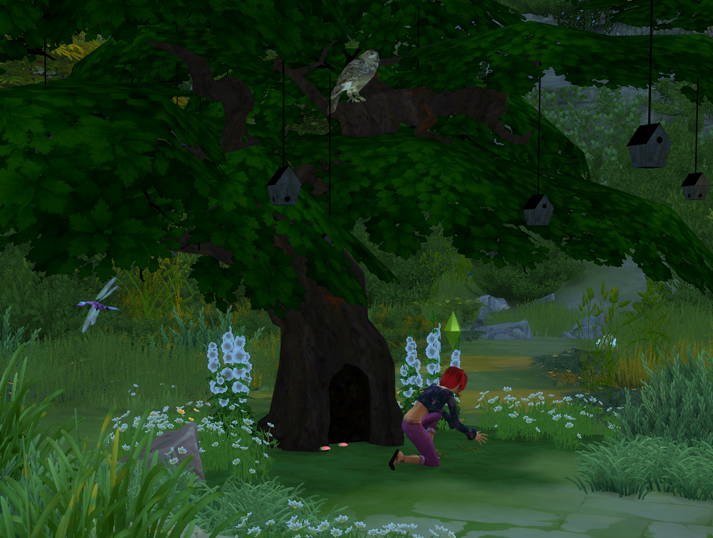 I have the insect mod which works well with this tree, beetles/ants etc, look as if they are crawling out of the hole in the base. 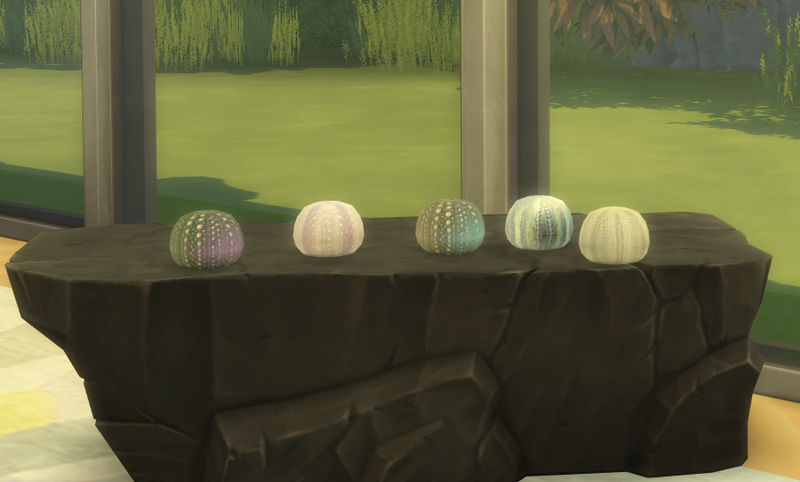 Two colours for the lanterns, the wooden ones hopefully give the impression they are bird/insect boxes. Size comparison, this tree is really big. Close up of Asylis' lovely owl. 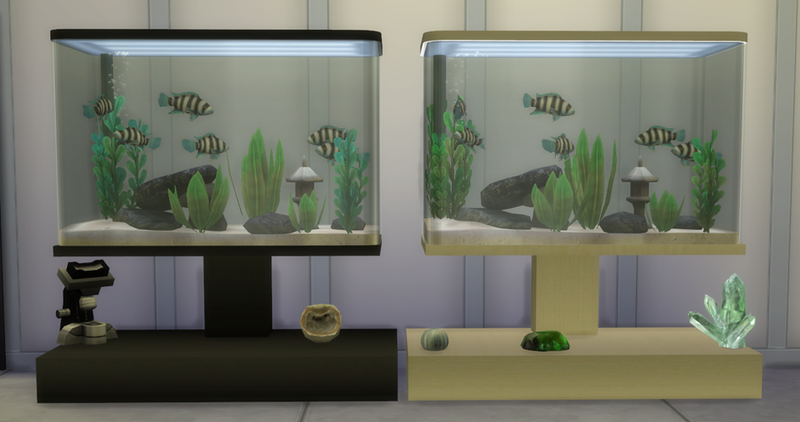 A new tank design to house your fishes. 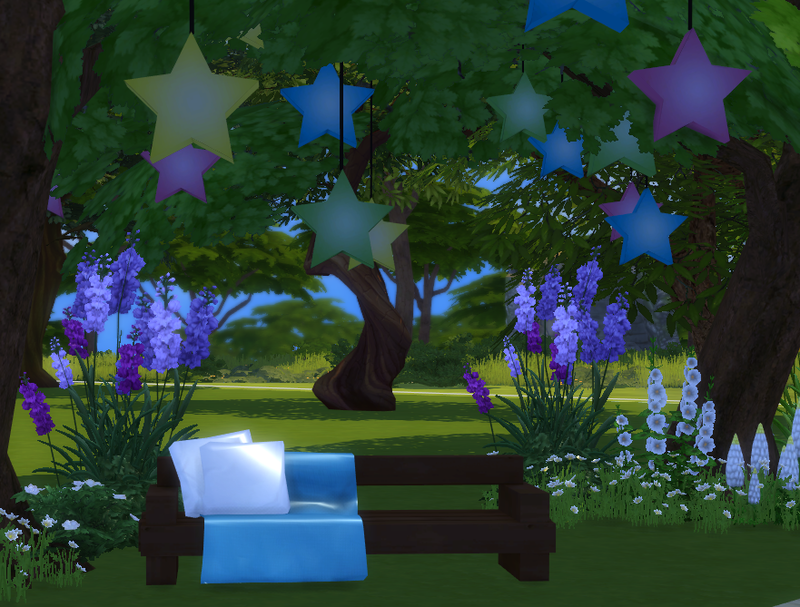 Six colours to suit adults and teens or a sim with a liking for bright colours. 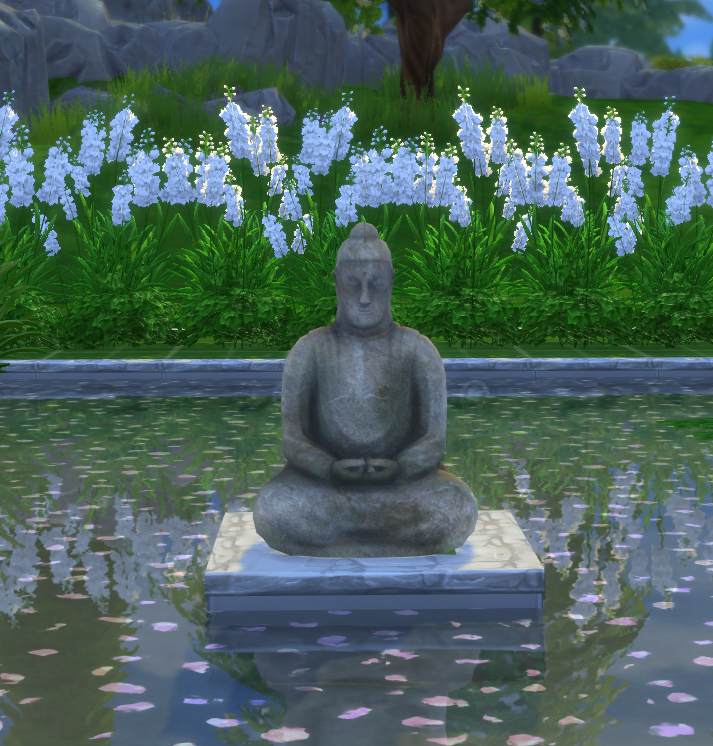 I could not replicate the water rippling across the front of the glass or the movement of the plants but it doesn’t affect the look or performance of this tank. There are lots of slots on the base and the top so you can clutter them up. Found in activities/miscellaneous for £150. 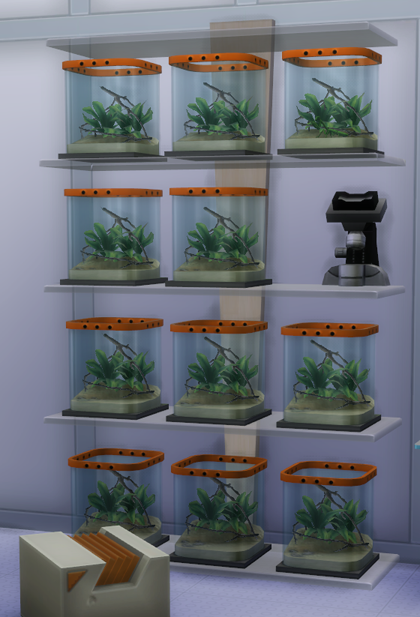 I made this tank for my lab which is why it doesn't have a top, its far easier for scientists to put things in and out without the fuss of a lid. 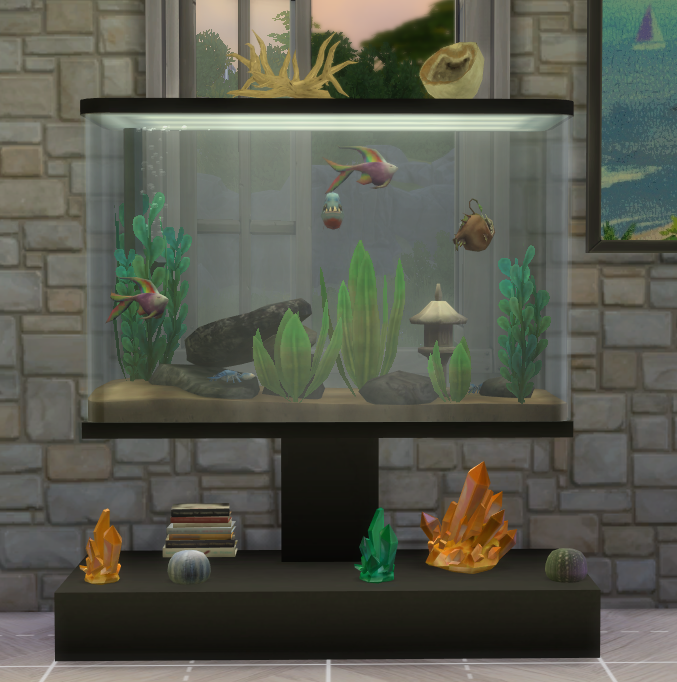 It can be used anywhere of course, I use it as a lab and home fresh fish storage tank; so the rare and everyday fish they cook with are always super fresh. 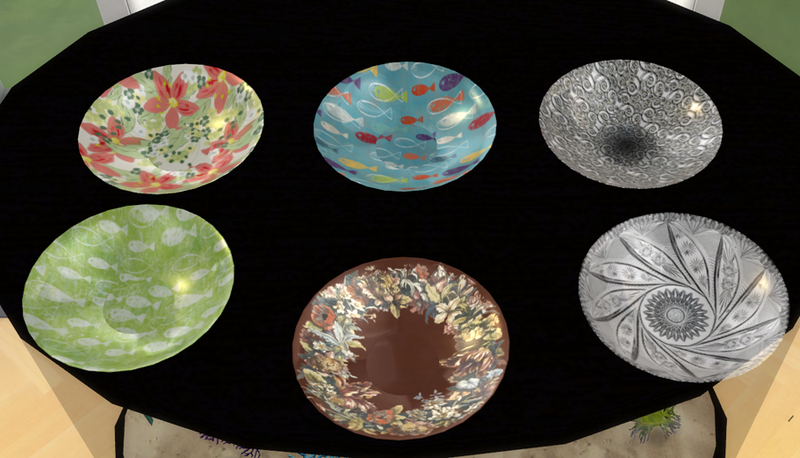 Five colours, there are two that have a concrete base texture that I use in the labs. Slots on the bottom. £150 in activities/miscellaneous. This is my favourite tank, I designed it especially for the lab but it can go anywhere. There are slots on the base but not on the suspended LED light over the water as I knew in real life it would be daft to put things on it. I change the light colour to purple which gives it a real tank glow. The black tank has purple tinted glass but it is a very subtle effect. Three colours for the base sand and rocks. Found in activities/miscellaneous for £200. 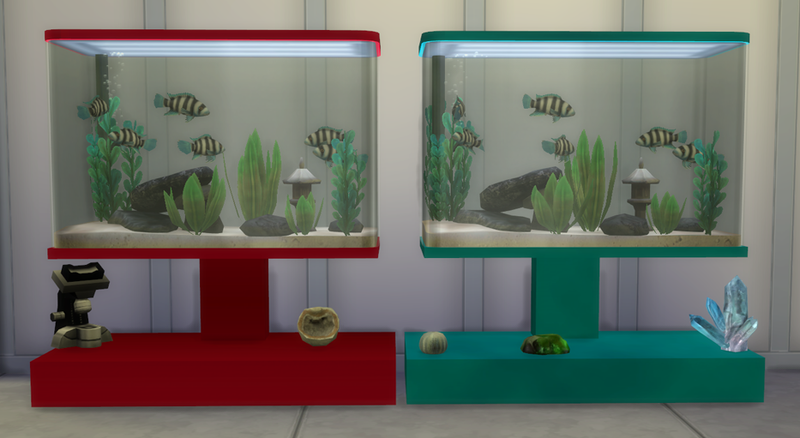 I made these to sit in the above tank but thought they looked nice displayed outside the tanks too. Five colours, just- the first and second are only one blue shade apart. Found in clutter for £5. Updated will no longer be put in the toy boxes. So the drink fountain? I always wanted more and different colours. I added a glass shader and some colours I thought might fit in with different events. I'm not great at re colours I did eight in case I had too (past experience has presented a few problems with adding and removing swatches.) The rainbow one might fit in an Alien environment. Will no longer be put in the toy boxes. I was making something else but after pulling the mesh around and bending it slightly it looked like an open plate to me. I wish I could figure how to put things on it, I did try but it looked hinky. 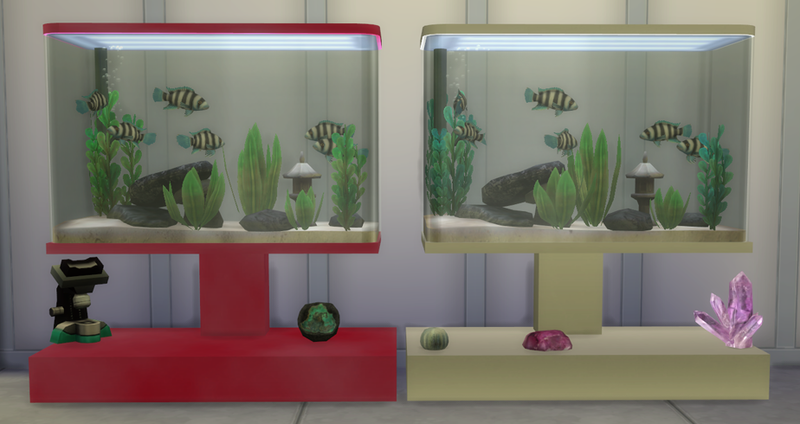 Six colours, two fishes (beachy?) two flowers, one modern and one traditional, and two cut glass. They have a single footprint but will clip through things if they don't have enough space around them. £10 in clutter.